In between the climate scare stories come the excuses for the non-events the scares were about. How the world becomes ‘increasingly hot’ with little or no increase in average temperatures is not addressed. As glaciers melt due to climate change, the increasingly hot and parched Earth is absorbing some of that water inland, slowing sea level rise, NASA experts said Thursday. Satellite measurements over the past decade show for the first time that the Earth’s continents have soaked up and stored an extra 3.2 trillion tons of water in soils, lakes and underground aquifers, the experts said in a study in the journal Science. This has temporarily slowed the rate of sea level rise by about 20 percent, it said. 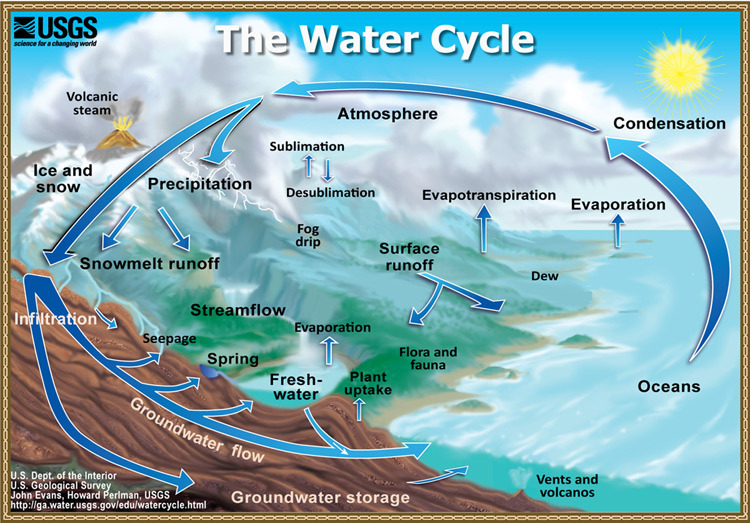 The global water cycle involves the flow of moisture, from the evaporation over the oceans to the fall of precipitation, to runoff and rivers that lead back into the ocean. Just how much effect on sea level rise this kind of land storage would have has remained unknown until now because there are no land-based instruments that can measure such changes planet-wide. There’s more [link below] but you may have had enough by now. They are clutching at straws – it’s so weak, it’s laughable. What part of the 1% is in groundwater – enough to make a serious difference to the level of the 97%? How? Meanwhile, legal action is threatened by Welsh villagers over dodgy sea level rise forecasts. But note, something from the priestly side, you never preach the same sermon more than once or the flock quickly loses interest. Innovate or be forgotten. But they may have a point. If the land is that parched it will float higher on the earth’s mantel -lower density. So you don’t see any sea level rise. But then the reverse — !? Who was the guy who said “If your theory does not fit the evidence…….” ? Have you looked at the ocean heat content data? It shows increasing heat content in the oceans during the hiatus period, though with a bit of a slowdown: https://www.nodc.noaa.gov/OC5/3M_HEAT_CONTENT/heat_content2000m.png. But isn’t it because the missing sea is at the bottom of the sea, or ……I give up. Well, a Nature Climate Change article (http://www.nature.com/nclimate/journal/v4/n11/full/nclimate2387.html) in 2014 found that, essentially, the deep oceans cooled from 2005 to 2013. However, that doesn’t alter my point. Gravitational waves, do they transcend the CMB? A window to the multiverse. Today’s climate hobgoblin is the dustbowl scenario. oldbrew, that link paints one of the ugliest scenarios. And not only for the US, but it is worse for others who, since the thirties of last century have become dependent on the produce of the US wheat belt. It could be very nasty for many. If the facts do not agree with theory – all the worse for the facts [Georg Wilhelm Friedrich Hegel, the posterchild of irrational philosophy]. Chaeremon, thank you. Someone, I think on this site, posted part of a video about a man who quoted that piece wisdom. Could not find it. I would like to see the whole video. The rise or fall in ocean heat content quoted is within the error margin of the measuring technique. In other words, it not real. Forgive that last comment, I thought that a person was responding to me but they weren’t. Stephen, do you have a source for that? How about a peer-reviewed citation? Could you link me to where NOAA says that (or whoever calculates the data)? 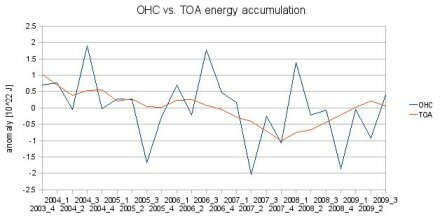 0-700m OHC vs TOA balance from CERES flashflux prior to the 2010 OHC data ‘adjustment’. Interesting, but that doesn’t answer my question to Stephen. Anyway, I don’t know if we ought to be suspicious of the adjustments simply because they adjust it upwards. Perhaps there was a valid reason. But that graph is very interesting, as I said before, especially since the new OHC data looks much different on that timespan. p.g., but global sea ice is below normal right now: http://arctic.atmos.uiuc.edu/cryosphere/iphone/images/iphone.anomaly.global.png. So far as Pielke Sr could ascertain, they dropped rapidly cooling buoys from the dataset because it was assumed there is something wrong with them…. That does indeed seem rather odd. Especially since the OHC previously went pretty well with the surface measurements (of that time) and satellite data. Toss another one onto the basic “we can’t account for the lack of X at the moment and it is a travesty that we can’t” pile. Speaking for myself and my own focus on a non-science facet of the issue, I can’t wait to see what the excuse is from Al Gore, Naomi Oreskes and Ross Gelbspan is about the sheer lack of physical evidence (full context document scans, undercover video/audio transcripts, leaked emails, money-transfer receipts, etc.) proving skeptic scientists were paid to fabricate demonstratively false science papers, reports, assessments or viewpoints. No doubt it will be something to the effect of ‘dog-ate-homework’. Keep in mind that Oreskes said particular damaging fossil fuel documents were archived at AMS’s place in Washington D.C., but Ron Arnold got it corroborated that they never were: http://gelbspanfiles.com/?p=2627 So, if anybody were to confront Oreskes directly over that, just imagine what her response would be. Yes, southern hemisphere SST’s took a definite dive during the noughties. It requires some [cough] interesting approaches to the 2nd law of thermodynamics to have the deeper ocean warming through a cooling layer above it. I think they’ve decided to ‘adjust’ the SSTs instead. However, like I said before, that Nature Climate Change article said that the deep oceans cooled from 2005 to 2013. Did you know that there are sea ice fields at both poles? Maybe if we got a definitive answer on whether Greenland and Antarctic glaciers (land ice) are net increasing or decreasing we would have a reasonable answer to what a slow down in ocean level increase is caused by. Somehow I doubt seriously that underground aquifers are gobbling up water since all we ever hear is that they are dropping due to over pumping by man. Is there any real data that suggests any aquifer is gaining water volume? If you are pumping millions of gallons a year out of the aquifers it obviously has to go somewhere… either in the ocean or as ice/snow on land. In fact, what are the estimated amounts of water extracted from the aquifers? What are the estimated amounts of liquid water that shows up as sea level rise? Which brings me to circle back to the ocean level issue itself, ocean level, i.e. liquid water volume is a function of overall planetary climate conditions. Looking back just 500 years we see that the ocean level was 18 inches lower than today during the Little Ice Age. 2000 years ago, during the Roman times, ocean levels were 18 inches higher than today. Overall there has been a 36 inch swing in ocean levels over a 1500 year period, all of which coincided with acknowledged global temperature swings. It would be a fair statement to make that every global average temperature has a corresponding ocean level. If this is a reasonable conclusion, then looking at the satellite temp. data, we can say that a flat trend in global air temperature would induce a flattening of the ocean level trend with some to be determined delay period (flywheel response in energy storage) that will eventually cause a peak (cessation in rise) in ocean levels. Does the current diminishing trend in ocean level rise infer a time period to achieve that peak? The year?